A Chinese face. A Chinese name. A GermanPassport. And still a Chinese face. The lead singer proudly adds when being asked after his performance at the China Days in Cologne last weekend: “I’m Chinese, I have a German Passport and a I feel both cultures in me”. His tone sounded confident and proud. When we talked for a little while about his music, his band and the social network where we met, facebook, I was astonished about his competence in German language. Almost no accent. A clear, strong and convinced voice. Of course he would remember me, he said with a smile. I again was astonished about him, remembering my face because we had never met and we don’t have a special contact via facebook. He’s just a person- He is some Chinese man on the list of my “facebook-friends”. I’m only one of those strange looking German faces which don’t seem to be so familiar to the Chinese, I suppose. To be honest I felt glad and ………………..friendly touched by his words. I also felt some kind of invitation to get to know more about him and I’m sure that it will be an interesting and inspiring “come together”. Some day. Somewhere. Or just here while writing and remembering last Saturday. I had asked him just to make a photo to have it posted in my blog, because I know how interesting photos are in contrast to words. To be aware of a person often is much more moving and touching than words. Especially in the digital world. Up to that moment he, the lead singer, had only been a name, a number and a picture in my facebook-list of so called friends. And within some seconds , opened up by his smile and friendly looking, we had met and touched each other in the non-digital world. Maybe we never meet again. Maybe we never have contact again. And yet this “meeting in between” gave birth to a picturesque image, a convincing metaphor of cultural integration. Of two man rooted in very different cultures. Feeling “integrated” for the moment when smiling at each other. 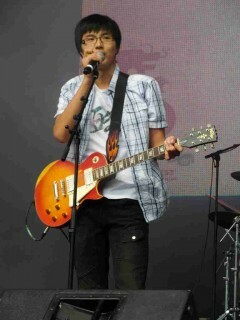 He is the lead-singer of the Chinese Rockband “Rising Dragon”. His band plays German songs, English and Chinese songs. The band feels connected to all those three cultural backgrounds while singing. And on stage they unite these cultures. Listening to an American rocksong at once mobilized my feet, following the rhythm of the music. Of course I knew the song and I felt familiar in “my world, my culture” still looking at a Chinese face. Listening to a Chinese song at once opened up a firework of glimpses, glimpses of Chinese images which came up into my mind. With a big smile he then addressed to Cologne and the typical cultural elements of music explaining of course in German the group’s motivation to play especially this song. To be honest again it felt strange listening to a typical Cologne song and still looking into Chinese faces. 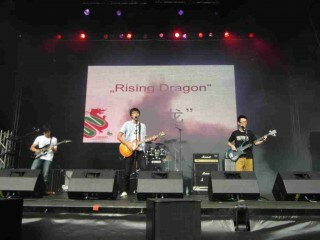 The faces of the Chinese Rockband called “Rising Dragon”. The band building cultural bridges in the shadow of the dome of Cologne. What is cultural integration I asked myself again and of course, as I told you, I realized ………………………..